This CD is a re-issue. It was originally released by German Bellaphone in 1995 and since the demise of that label it has been unavailable. 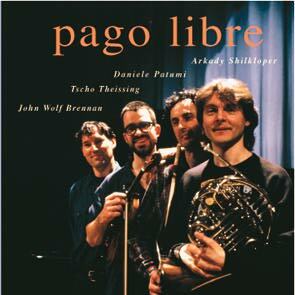 Pago Libre is a super group: Arkady Shilkloper - horn, Daniele Patumi - bass, Tscho Theissing - violin, John Wolf Brennan - piano, melodica. There are 12 pieces on the CD with each member of the quartet contributing a couple of compositions. Notes by Alex Kan.